Have you ever looked around your house and thought, wow, this is so BLAH! That has been my feeling of late. Granted, I need to change things up and do some wall painting… but with what? So now onto the tough questions. Have you recently purchased a piece of art that inspires your soul? Is your home or personal space reflective of who you are? Do you admire the work of an artist or photographer, crafter or creator, yet shy away from buying something from them? What is stopping you? Think of it as buying local for your soul. It’s a win/win! I FINALLY bought a print from an artist that inspires me… and its really what got me to thinking about this whole idea. It felt ridiculously indulgent. 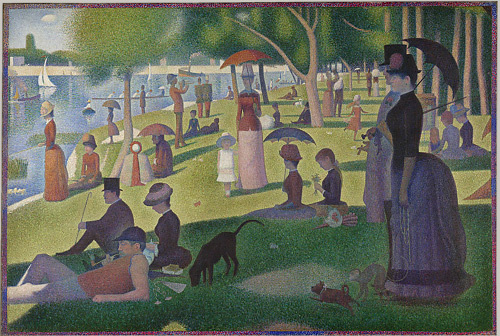 I had only ever done it once before when I bought a print of George Seurat from the Metropolitan Museum of Art. The idea of pointillism simply amazes me. Unfortunately, the print has a really pink border and even a pink metal frame so it ended up relegated to a dark recess of the basement. Perhaps I need to change the frame and bring it out once again. So, you saw what I did to my dining room chairs. I think there is going to be more of that color splashing going on in this house. I am going to hang my new Instacanvas print and make over some blah frames needing a pretty display inside them. Watch out beige, ecru, dustysand walls! I am not sure you are going to know what hit you!